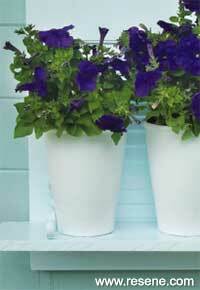 Mark Rayner shows how to recycle an old wooden louvre-style cupboard door into a chic display shelf for potted plants. You will need: An old wooden louvre-style cupboard door, piece of recycled wood for shelf approx. 20mm thick, three small Long Tom terracotta pots, exterior woodfiller, putty knife or similar for filling, sandpaper, clean cloth, two decorative metal shelf brackets ours came from Mitre10mega, 20mm stainless-steel screws, screwdriver, PVA glue and a paintbrush. 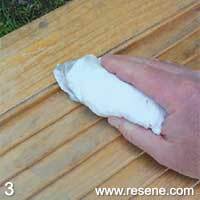 Resene Quick Dry, Resene Terracotta Sealer, Resene Lustacryl tinted to Resene Tranquil Resene testpot of Resene Alabaster. Top tip: For a neat finish, fix the display shelf to a wooden or shed wall with two sturdy flat galvanised head nails. Spot prime the nail heads and once the primer is dry, touch up with the same colour paint. To get the look: Mark painted the background shed wall with Resene Lumbersider tinted to Resene Unwind. 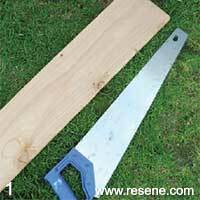 Measure, mark and cut the piece of wood for the shelf so it’s approximately 100mm wider than the cupboard door. Sand any rough edges. Fill any holes in the cupboard door with exterior filler, allow to dry, and then sand smooth. Lightly sand the cupboard door to remove any loose varnish. 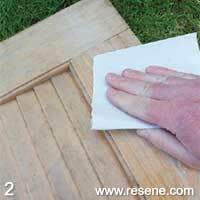 Wipe off any sanding residue with a clean cloth. 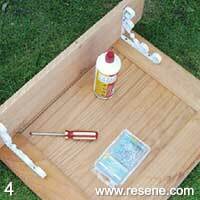 Run a line of PVA glue along the back edge of the shelf and then fix into position on the cupboard door, as shown. Attach the brackets using 20mm screws. Wipe off any excess glue and allow to dry. 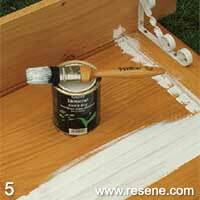 Apply one coat of Resene Quick Dry to the entire unit and allow two hours to dry. 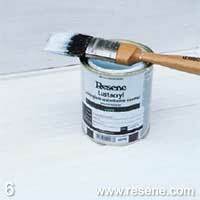 Apply two coats of Resene Tranquil to the entire unit, allowing two hours for each coat to dry. 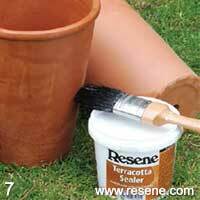 Apply one coat of Resene Terracotta Sealer to the inside and outside of each terracotta pot and allow to dry. 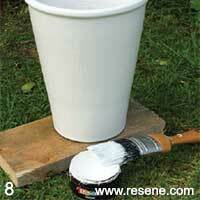 Apply two coats of Resene Alabaster to each terracotta pot, allowing two hours for each coat to dry.